At Autobahn West, our first priority is customer satisfaction. We strive to make purchasing a BMW a simple and comfortable experience. Our exceptional customer responses and feedback reflect our way of doing business. In fact, a large portion of our business is referrals from happy customers . . . If you have purchased from Autobahn West and have a photo or comment you would like to add, please contact us! "Just bought my 535i BMW today from Tim at Autobahn West. He found me everything I was looking for in a car and then some. Thank you for all your hard work and professionalism. I highly recommend his dealership for your next purchase." "Let me start of by saying Tim is a true BMW enthusiast who has an eye for finding rare and unique cars in great condition that are in demand. I have bought 3 cars from him over the past 9 years and each experience with Tim and the cars have been exceptional! My first car purchased from Tim was a 2001 BMW M Roadster Convertible, my second was a 2003 Z06 Corvette, and the third was 2007 BMW M Roadster Convertible. Each of these cars was a blast to drive and I would be hard pressed to pick a favorite. Tim has always gone above and beyond to make sure the purchasing experience was easy and stress-free and his number one priority was to make sure I was pleased with the purchase. His customer care has been very impressive to me and I would say it is almost unmatched in the car industry. If you are in the market for an exceptional car at a great price with fantastic customer service you need to go see Tim at Autobahn West!" "Best car buying experience after being treated horribly by BMW of [*****], Tim lists his vehicles for a fair price so there little reason to haggle or go through unpleasantness. The warranties he has available make a used BMW the best option. I highly recommend Autobahn West and have already told all my friends to go here for cars. Love my x5d!!!" "When I first went to the showroom, I was surprised at the quality of the inventory. And then I talked to Tim. I took the car for a test drive and then went to other dealers. At the end of the day, both my wife and I just wanted to do business with him. It turned out to be one of the best car purchase experience in my almost forty years of car ownership. Tim was honest, straightforward, trustworthy (there's a term rarely used when buying a car) and knowledgeable. Overall a great experience. I had one small problem (a sensor light) that was resolved at my convenience. I strongly recommend Tim and Autobahn West. I would refer anyone without condition." "You can tell Tim has a real passion for what he does, along with having extensive experience in owning and modifying High Performance cars. At first I have to admit, I was a little skeptical about buying a car from a small dealership, but after meeting and talking to Tim, I'm blown away. The car was also under BMW factory warranty. As someone with what has previously been called a "problem" with buying and building performance cars... This experience was one I would do again and again. Over the years I've probably owned and built 10 or more high performance cars. This was by far the best experience of them all. After buying a BMW 135i from Tim at a price that couldn't be matched anywhere, I ended up deciding to go a little extreme by adding a Dinan package @ Stage 3, along with a new suspension set up as I intend on doing some autocross in this car. All the work was completed in less than 10 days and Tim even met me on a Sunday to collect the car when I needed it. If your in doubt about going to see Tim, don't be. The guy is as stand up as they come. I'll be doing more business with him in the future for sure! Thanks Tim and everyone at Autobahn West." "What I can say about Tim as a salesman is that he is there to inform you about everything that he knows, and not just the good stuff. He will share his previous experiences with vehicles along with providing his plethora of knowledge behind the BMW company. Myself being a fellow car guy and spending countless hours researching and being around it my whole life, I was able to tell he was the same. Working with Tim through process of actually purchasing a vehicle couldn't have been easier. He was there to help from beginning middle and end. Always responds to texts, emails, or phone calls within minutes and was more than happy to walk me through the process. I strongly recommend anyone in the market for a BMW vehicle or anyone looking for service, to not pass up the opportunity to visit Tim at his location. A valuable resource during my recent car purchasing experience, and most likely in the next." "First off, Tim is not a car salesman. Tim is a knowledgable, helpful, and talented car enthusiast that just happens to place rock solid BMWs in the hands of individuals that are looking for quality. His shop has the feeling of being in a friend's garage that has some pretty damn cool cars in it. You are getting one on one service and not dealing with some guy just trying to make commission. He gave me a more than fair price and was easily the least trying negotiations I've had in my life. I bought a 335D model and it is just as Tim advertised. The car runs great and I couldn't be happier. If anyone wants a quality vehicle at a reasonable price call Tim and you won't be disappointed." "My experience with the purchase of my car from Tim at Autobahn West was nothing less than exceptional. My husband and I have always hated going to any kind of car sales lot to look at cars or just test drive them - wondering which one of the vultures hovering around would make us their next "victim" and to try to convince us they were the only ones who could make us the best deal. I was extremely nervous about buying a vehicle sight unseen, but Tim went the extra mile to answer all of my questions and address all of my concerns. He also worked with us so we could stay within our budget. We did all of our communication via email and I had never even heard his voice until he picked me up from the airport! He took the time to show me many of the features of my new car which made it a breeze to drive it the 560 miles home. I was amazed at how smoothly the process went with Tim. He is truly a stand up guy, and I will continue to recommend him to everyone looking to buy a quality vehicle from someone who will give outstanding customer service. Tim, it was a genuine pleasure to meet you and do business with you. Thanks again! F I V E S T A R S !!!!! I couldn't be happier to be the proud owner of my beautiful Crimson Red 2011 BMW 535i." "Tim is a straightforward, educated, and extremely knowledgeable guy. His collection of cars tend to range from entry level to exotic and he is extremely good at listening to his client and finding the right fit for them. I fell in love with one of his cars (which was more expensive than what I bought) and he encouraged me into another one of his cars based on how meticulous and well equipped it was. I appreciated his desire to make and keep me happy over just selling me a more expensive car. It took me a while to relax and trust him but now I do 100%. You can expect full disclosure and honesty from him. At first I was expecting a shady garage and a sleazy used car salesman... not what I found at Autobahn AT ALL! Cars are quality and Tim is classy, educated, and simply living his passion (CARS) which shows in his approach, resolve, and full disclosure. I will definitely be back to visit Tim when I am done driving the beauty I just purchased from him. Traded my Maserati for a BMW 550 M Sport... NO REGRETS!!!" "I have wanted a Manual Transmission BMW ever since I first got my license. One day I woke up, read a Jalopnik article on the 'baby M5', the E39 540i M-Sport, and I was immediately on a new quest. Through a recommendation from a fellow BMW enthusiast, I gave Tim a call and arraigned an appointment to take a look at the 540i he was selling. He was extremely courteous and patient, and even took the time to teach me how to drive stick! Tim is truly an enthusiast first, seller second. I visited the dealership three separate times to look at the car, and he never pressured me to make up my mind. Now a beautiful piece of BMW history is sitting in my driveway, and I hope to buy even more of these machines at Autobahn West. BMW fans- this is your first stop when looking for the Ultimate Driving Machine!" "I would recommend Autobahn West to anyone! Tim is friendly, helpful and very accommodating. He made me feel very comfortable through every step of the car buying process. I was cautious at first, being as it was my first time buying a car, but Tim quickly put me at ease and was very honest and straightforward in all aspects of our interaction. I had done a lot of research about the particular car I wanted and the VW I found at Tim's was competitively priced and in immaculate condition. When I first called him about the car he said it was worth a 2 hour drive to see...he was right! I love my new car and will definitely visit Tim first the next time I am buying a car! Thanks Tim!" "In my search for the perfect BMW 335d I looked high and low for month(s) and just couldn't find the right car, I was literally going crazy. I couldn't believe how unprofessional most of the BMW dealerships I went to were. They also were not willing to negotiate much at all and had inflated prices. Then I saw Tim's dealership Autobahn West on Auto-Trader and read all the testimonials. I was impressed with them so I decided to give him a call. Typically I wouldn't deal with a non BMW dealership but after talking to Tim on the phone several times I felt completely at ease. This guy KNOWS his stuff, is 100% honest, and is EXTREMELY fast at getting back to you. He is BMW enthusiast and has a great eye for cars that are in pristine condition. I asked him a ton of questions and he never got tired of them, in fact he enjoyed answering them all and thanked me for asking them which was comforting. He was able to send me the service records on the car from the BMW dealership as well as a warranty report that showed every single option on the vehicle within minutes via email. I was not able to see the car in person because I live all the way in TX and his dealership was in California so I really had to rely on everything he was telling me which as you can imagine is difficult. In the end he put my mind at ease and I decided to buy it. I wired the money and Tim promptly sent the paperwork and fed-ex'ed all the documents and title so I could have it switched into my name before it even got here. I had the car 2 days later. Tim made sure it was put in the best possible place on the freight carriers truck to avoid bugs etc. When I got the car it was a 9.9 out of a 10. No kidding either, the car was absolutely FLAWLESS inside and out. Every single thing he told me about it was accurate. I've never loved a car this much before. This is my dream car and for it to be so pristine makes it that much better. In the end I couldn't be happier with the choice I made to buy from Tim. He saved me thousands of dollars and now I also have a great resource who I can call and ask any kind of BMW question I can think of. If you see a car you like that he has.. do not hesitate to buy it! You are dealing with an honest guy who is a pro at what he does. Even the local BMW dealership close to him vouches for him. I'm so impressed with the car and service I got I'm willing to leave my email address here if you have any questions." I cannot thank you enough for such a wonderful car-buying experience. Not only was the Z4 in pristine condition, your knowledge and service far surpassed that of other dealerships. My Z4 is beautiful and I am having a blast driving it around town - I am even being so generous as to let Jason borrow it every once in a while! I am thrilled that we had the pleasure of meeting you and am looking forward to more great BMW-buying experiences in the future. Thank you again!" "Tim, the owner, is one of the most honest, trustworthy and respected individuals in the business. He sells high quality cars at reasonable prices, has great communication skills (always responds to emails and calls in a timely manner) and is just an all around nice guy. I purchased a used (practically new condition) BMW through him in which he beat everyone else's price, met me at the airport with paperwork and keys and was extremely accommodating the entire time. Would do business with him again!" I want to thank you VERY much for all your help in my purchasing this car. Absolutely ZERO pressure to buy. You went above and beyond in accommodating me, not only in the test drive, but also financing, and finally, in me taking delivery... at work! Just amazing and I am very very appreciative! The car is immaculate and a total joy. And as you and I noticed during the test drive an eye turner of the first degree! I cannot thank you enough! And, I cannot forget to say what a pleasure it was meeting Cami also! If any of my friends or colleagues are in the market for a BMW in the future yours will be the only name spoken by me!!" I wanted to share my feelings with you about how pleased I am with your dealership and the service I received when I purchased my BMW 540i. First of all, the car was in magnificent shape and condition. I had been searching for the perfect car like this for a long time but honestly never though I would find it. In my mind, your knowledge of BMW's, courtesy and friendliness is what sets Autobahn West apart from other dealerships. You are as advertised!" "I can honestly say that all the testimonials are 100% true. I love my new 325i so much! The superior level of customer service you offered me is something one must experience to believe. I have never encountered such accommodating, friendly and most of all, HONEST treatment at an auto dealership. Tim, you are truly a stand up guy. You really made the whole car-buying process simple, and dare I say it, enjoyable- and my new BMW is the icing on the cake! I have never had so much fun driving, and such a sense of pride for my vehicle. My friends and family are amazed at how immaculate the car is- it truly is a gem. You really took care of me, and for a first-time car buyer, that means everything. Thank you Tim!" "Now that I have purchased two BMW M cars from Autobahn West, I want to tell you just how impressed I am with your operation. As I have owned several fine European autos and shopped at many of the independent and franchised dealers in the area, I noticed a clearly higher standard of quality and preparation in your stellar BMWs. Frankly, I'm amazed at the condition of your cars after being jaded by years of shopping elsewhere. Even when compared to the BMW dealers, each of the varied models in your inventory is impressive its own right. I can see that your passion for BMWs and personal interest in your customers is genuine. As a repeat customer, I would highly recommend Autobahn West to anyone who desires a deeply satisfying BMW buying experience." Thanks again for helping make my buying experience so easy. Love the car and would highly recommend your services to anyone interested in buying a special vehicle!" First off, I'd like to THANK YOU very much for getting me into my dream car. Driving it for the past few weeks have been awesome. I never imagined that I'd actually look forward to driving to work in the morning! The car is an absolute rocket (no speeding tickets yet, but I'm sure one will be in my not-so-distant future). Performance wise, it is hands down the most fun car I've ever driven. To say that its an upgrade from my 1993 Mercury Cougar would be an understatement; also, I'm now the envy of my work's parking lot. I've got nothing but good things to say about your professionalism and dedication to your customers. Thanks again for all your help." I am still just thrilled every day that I get into my car!! It's so much fun to drive & I still can't believe it belongs to me! Thanks again for all your help, even though I was so nervous about having the car shipped, everything turned out just fine! You were an absolute pleasure to deal with & you really know your stuff! When Mark is looking to upgrade his car in a year or two, don't be surprised if we give you a call!! Thanks again Tim for everything, you are one of a kind out there so don't change the way you are doing things!" "I was a car dealer for 20 years in Philadelphia. While I tried to make the user experience very positive for my customers, I can't say the same for all my colleagues. When it came time to buy a BMW in California, I found Autobahn West. What a great experience! First class merchandise, honest representation, and fair pricing. It is the best I have seen and am a very satisfied customer." Just want to let you know how happy we are with the purchase of the 2003 530i---cannot be more happier or pleased. The sheer number of comments we receive on the condition of the car (how clean and new it looks) has been a big plus. You made the whole purchasing process easy and pleasant. The one thing that really stood out is your integrity and the passion you have for BMW's. After test driving many other vehicles, we have found the car that was in absolutely the best condition by far. We also didn't feel the need to worry about trying every little button on the car because of the confidence you had in your product which was very reassuring. We would not hesitate to refer other family and friends to you at Autobahn West." P.S. The kids love their new car! Thank you so much for your help with my new car--the 2010 328i Touring. All of your support and logistical help has been first rate. I appreciated the 'advisor' role that you took when we met in early May. You were a great counselor and not a salesman when you helped outline the high and low points of other vehicles that I was considering. In addition, your follow-through with paperwork, the ipod adapter, and even purchasing a front license plate bracket were all done with NO ADDITIONAL CHARGES. You simply stepped up and came through in all areas to make sure I was a happy customer. Finally, I think the best example of your integrity came through after we agreed on our price. As you remember, I had to hustle back to my conference in San Diego and you allowed me to purchase the car with a hand-shake so that I was not late for my meetings. Your communication was first-rate as we finalized the wire transfer, vehicle transportation, and title via phone and email in the following days. Thank you for everything. I will check with you again in a few years when my wife is ready for her next car." We really do love our 330i and Gail has already named her (Lola!) She was literally giddy all day getting her new car. And your attention to detail and mastery of every fact about BMW's made this past weekend a great experience. I really do love driving this car!" "Just want to thank you once again for all your help in getting me in to the best car I have ever owned! You pulled out all the stops & bent over backwards to help me achieve my goal of getting the Ultimate Driving Machine. Not sure where to start or end with this but from the beginning you were willing to assist in any way you could. You showed me the nuances of the car plus all the features. This was the best car buying experience I have ever had by far & will definitely be back when we need our next “BIMMER”. You definitely know your BMW’s & your love for these cars shows. I have already recommended you to a few folks that are thinking of getting a car now that they saw how nice mine is. I would recommend Autobahn West to anyone in the market for a fairly priced, clean & well maintained pre-owned BMW with no hesitations. AUTOBAHN WEST IS THE BEST IN THE WEST!!!!" Thanks for the great car! As you had said, it is absolutely stunning! I am really enjoying it. All of my friends and family love the car. The transaction could not have gone more smoothly. I recommend the car and Autobahnwest.com to all of my friends." "I guess sending a thank you by any medium is acceptable these days. I am using this electronic mode to thank you again for your efficient service in providing me with a remarkably inexpensive quality car. No doubt I will enjoy it for years... Again my thanks for making the purchase an absolute pleasure! :-)"
The pleasure was ours. You're a great guy and offer a service that is second to none. I fully expect lots of BMW envy from my friends and hope that I can get them to give you a call. The car is wonderful to look at and drive. It continues to amaze me with it's agility and responsiveness. It's going to take some time for me to adjust. This is time I'm always looking forward to." "Working with Tim and Autobahn West was a great experience! From start to finish they instilled trust and they went above and beyond to make the process go smoothly. Being from out of state we were a bit nervous about buying a car based on pictures and Tim's word. He even arranged for a pre buy inspection at the local BMW dealership. When I saw the car for the first time I was very impressed! It was in better condition than the pictures even showed! The process was so quick, smooth and easy. It was nice to work with a true BMW enthusiast and business professional. We love the car and would definitely go back to Tim and Autobahn West for our next car." My goodness, if all your customers are treated this royally, you will have more business than you know what to do with." "I literally cannot recommend these BMW Enthusiasts highly enough! They are not only easy to work with, knowledgeable about their cars (and BMW in general), and exert zero "sales" pressure, but they have the highest integrity I have ever experienced in the car sales industry (not just saying that, I have a specific story I could share). When they sold the perfect car before I came down to test drive (these cars are HOT baby... don't wait!! ), I was initially dejected. However, after test driving a couple of their babies, I was hooked. When I found out about their locator service, my hopes were renewed. My ideal car was rare, but they not only found it, but the BMW they found for me was FAR BETTER than I even asked for!! How about that for enthusiasm and love for what they do? You will find no better value, quality, attention to detail, integrity and love for the BMW vehicle anywhere else. 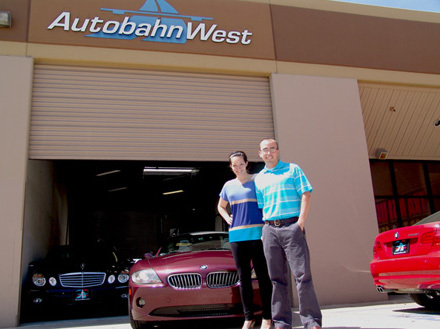 Buying from Autobahn West is not just a purchase, but a BMW ownership relationship for as long as you drive the cars. I promise you, you will love the BMW they put you in. I know I do!!" "I wanted to let you know that the car arrived safe and sound this weekend. The car is in excellent shape and we officially have the baddest (BMW) wagon in Town! I attached a few pics of the car 3,000+ miles away at its new home in Marblehead. Thanks for making this an easy process and delivering a great car." .... Thank you! (And I have already been telling people how this is the only car I ever had FUN buying from a dealer.)" I just had to tell you one more time what a pleasure it was purchasing my new red BMW convertible from you. Although the car is actually a few years old, the only difference I can see from one brand new is the price tag! My car is everything you said it was and more. But what really makes this purchase stand out is the way you run your business. This is the first time I have ever had FUN purchasing a car. Your knowledge and enthusiasm for BMWs is contagious. I felt more like a friend than a customer. I guarantee my next car purchase will be from you. You guys are the greatest !" Wanted to pass along how much I love my 330i! After visiting local dealers, it was refreshing to walk into your shop and find the car I wanted with a guy that has an obvious passion for his "work.". The whole process went so smoothly and comfortably, I already look forward to buying my next BMW from Autobahn West. I have passed on your name and business to friends that I know that are in the market for a new car. Not only do I love my car, my friends love my car. Great Cars, Great Service, and Great Prices! What more could you want?" "I haven't thanked you enough in making my vehicle purchase so easy! The minute I saw the sight and I walked in to your showroom I was sold! As you know, the next day I brought my wife over and she purchased the 740i I looked at the previous day! I didn't even need to test drive it, your presentation, knowledge and true passion for the brand is evident. Everyone that has seen the car can not believe that it is an 01 and the amazing condition that its in! I will definitely purchase another vehicle from you... now that my wife is getting the BMW fever!" "Thanks again. This is definitely the most fun I've ever had buying a car. We made it home in just under 3 hrs. Much better than the trip down there. We even took a little side trip to Tijuana for a couple of hours. Didn't drive the cars in there though! I'll check out BMWCCA. Ryan and Matt couldn't stop talking about the test drive you gave them. Ryan kept saying he was going to get an M5 some day and I wouldn't doubt that he does. It would be fun to go to one of the BMW events so please do let us know when and where. Everyone loves my car! Ryan kept coming up with reasons yesterday to go into town. My oldest son came over yesterday and had to test drive it too. I'm very happy... I also mentioned Autobahn West on the Bimmerfest board." "We want to thank you for one of the best car shopping experiences we've ever had. You have commanding knowledge of BMW products which is very reassuring. Most important, you have integrity – you are a man of your word, which is everything! We look forward to doing future business with you (especially when I'm (Ed) ready for an M5!)." "Tim at Autobahn West is a BMW car freak first and salesman last. They love their "bimmers" more than anyone and love to see their customer's eyes and smile as they first see the car. My new ride - it was more than I expected. Tim, Autobahn West and the car are truly magnificent and I would recommend them to anyone." Thank you so much for making this as easy as possible. I wish everything in life were so easy and painless. Plus the car is totally hot. No one envies the driver of a Pontiac. Every BMW owner knows that our vehicles hold top residual and resale values even in todays market. Cars have never been a good investment (non-business), but they can define our character as people and can have a dramatic effect on ones opinion of driving. For those who have not experienced the true ride quality and performance that only BMW can offer, I feel truly sorry. Last year I told my wife that she could have any car she wanted (w/in reason). She test drove several foreign & domestic vehicles before finally decided on the 2008 Acura TL w/Navi - a very nice car indeed. One day she asked to drive my car to work, as she was low on fuel, by the time she reached her office I had already received 3 text msgs telling me how incredibly tight & nimble my car was. The next morning rolled around and she "forgot" to get gas again, so she use my car again. She has since admitted that perhaps my car is the better of the two vehicles and I paid nearly $2k less!! Granted my car was one year older 2007, but with 10k miles at the time of delivery, I would make that sacrifice every time to end up with with the "right" car over the "new" car. If you are on the fence, let our experience be a lesson learned& save yourself the heartache & money. There has never been a better time to find out what your daily commute has been missing. I can admit making one mistake in the process of buying my BMW. Not buying it much sooner. As the ex-owner of several (34) vehicles in my life, I have experienced nearly every style, type and brand of car on the road. This is the only one that I can honestly say returns the favor every time I turn it on. immediately upon inception of their vehicle and are at their peak happiness. I wanted to wait and see what my opinion was after having the car several months. Needless to say - No buyers remorse here!! Actually happier with the car now than I was the day I got it. "Just wanted to touch base and say thanks again. You're forthright, personable, and a pleasure to do business with. Of course, the car certainly is everything we expected, and more! I look forward to our paths crossing in the future." "The Hummer is AWESOME, my daughter does not want to get out of it (she is 12), I think she would sleep in it if we would let her. Dealing with you and Autobahn West was nothing short of exceptional. The H2 was everything you said it was and more. Me and my family will certainly enjoy it. If anyone would like a reference for a long distance purchase through you they are more than welcome to contact me for a reference, the peace of mind you created for me was great. Thanks Tim." "I wanted to take the time and let you both know how pleased we both are with our purchase of the 2001 740i Sport you had for sale. We visited your store with the intent of merely looking at the car and learning more about its features. After only a few short minutes with you both, we knew that this was no ordinary sales experience, and that you both were more interested in making sure your customers were satisfied than with closing a simple sale. Finding an amazing vehicle for a fair price was just icing on the cake; we knew that your dealership was one that we wanted to do business with. Your post-delivery support has been even more amazing, and just confirms that we made the right decision ... by purchasing from you. We have purchased new cars from so-called premium dealers that haven't received one-tenth the care, attention and support that you've provided. We have already told friends and acquaintances about our terrific experiences with you, and we'll be telling more every day. Thanks for restoring our faith in what a car purchasing experience should be!" "I absolutely love this car! It's even better than you said! Thank you so much! My mechanic checked it over after I drove it home and he verified - it's in perfect condition! (He couldn't believe it was a 4 year old car - and I can't either!!)" "... of course I'll tell everyone that asked me where I got the car at and how cool and how great the president was." "We made it back just fine....it only took us 4 hours, and NO speeding tickets!!!! The car is absolutely awesome!! We are very pleased. We will definitely stay in touch." 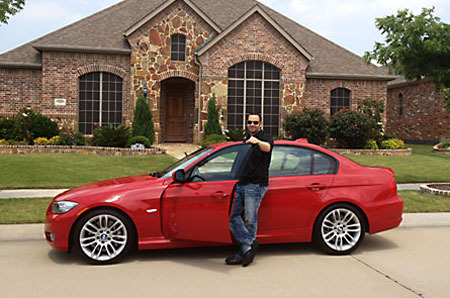 "I'm extremely happy with my Red 330i ZHP. I have wanted a 3 series for many years now, and this car has fully met my expectations. My purchase experience with you was great. You were extremely easy going, straight forward, and responsive to my requests. It was so nice to deal with someone who like my self, loves BMWs for their driving performance. And to boot, I really look forward to seeing you at the autocross event on the 4th. I will definitely recommend you to any BMW enthusiast shopping for a used BMW." Hahaha what a trip! Thanks for your professionalism throughout all of our contact, I had the drive of my life on Sunday. And yesterday the sun came out up here so I spent hours and hours discovering every back road off the 101 north of SF :-) I took just about every single exit off the highway, wound through the twisties, got back on the 101, then took the next exit, and so on and so on.... just for the hell of it! I am totally in love with the car, passed several E46 M3s on my trip and very happy that I decided to go for the roadster instead. It sounds so angry with the exhaust right under your arse and the top down - I can't get enough of that sound! It's my first drop top but I think I am already turning into one of those people who drives with the top down on freezing cold nights with the heater on max just so I can hear that noise. Don't even get me started on driving through tunnels..... Thanks again, I enjoyed hanging out with a true enthusiast....."